One of the world's most prolific wine producers, the Antinori family, has been producing wine for over six centuries, since 1385, over twenty six generations. Today they produce over 500 different wines from properties around the world. We tasted two of their flagship premium labels during our gala Italian wine tasting last month - Guado Al Tasso and Tignanello. Today we tasted their 'every day' wine, what I like to call 'pizza wine', wine for every day casual drinking, say with pizza. Lets face it, most of us have limited or finite funds to spend on wine and must moderate our consumption. (I recall reading the biography of Henry Ford (Ford: The Man and the Machine, by Robert Lacey, 1986 - Little, Brown & Company) that each evening at dinner, he drank Chateau Lafite Rothschild, c'est la vie!). I refer to every-day wines, 'once a week', 'once a month', year and 'once in a life-time wines' for collecting and eventual consumption at some special occasion. This would be one of those wines to buy and drink, not hold for a special once per month or per year occasion. Most notably, besides being widely available at an affordable under $20 price point, it is a respectable, reasonable quality drinking wine offering good QPR - quality price ratio for 'every day' consumption. While it is not elegant, refined or polished, it does provide full body and full flavors, ideal for pasta, pizza, burgers or even a steak. For a casual lunch outing with friends Jackie P visiting from Phoenix with Kathy M, we dined at Nuova Italia in St Charles. Relatively new to the St Charles scene, this long standing Addison restaurant opened in a stylish and quaint old church on 4th street for a delightful quaint picturesque setting. They offer a extensive selection of Italian dishes of high quality, and good portions for a great value dining experience. Nuova Italia offer a basic, modest but fundamentally sound wine list, to accompany the basic Italian fare. 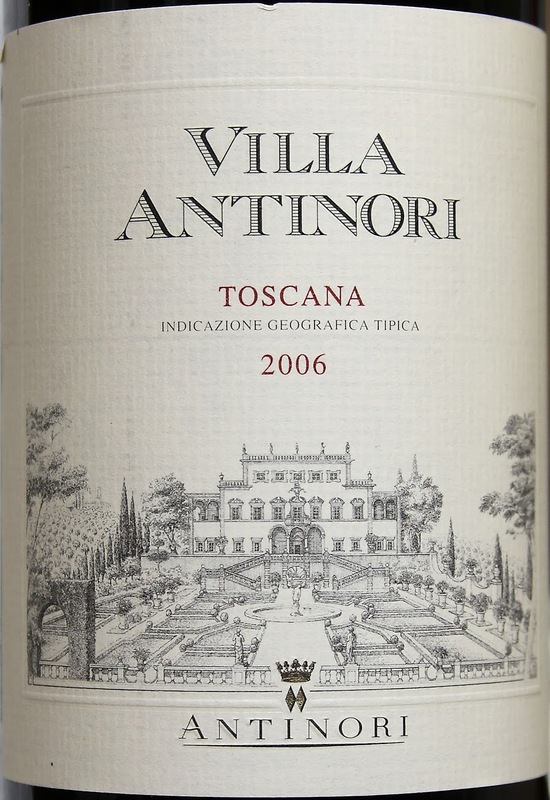 From the list, we selected this Villa Antinori Toscana. This is what is known as a 'super Tuscan', a blend comprised on big bold varietals indigenous to the Tuscany region, but also well known and grown in Bordeaux and California - Cabernet Sauvignon, Merlot and the Italian varietal Sangiovese. The inclusion of Sangiovese in an otherwise Bordeaux blend is what sets this apart from a Bordeaux style and makes it a super Tuscan. In this case, the blend is 55% Sangiovese, 25% Cabernet Sauvignon, 15% Merlot, and 5% Syrah. 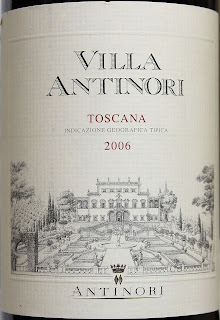 Per the winemaker's notes, "Antinori Villa Toscana IGT is intense ruby red in color. The aromas are also intense and complex with notes of spices, mint, and chocolate, which are particularly felt along with light aromas of rip cherries. On the palate the wine, savory and long, is full-bodied and round with supple and velvety tannins." We found this to be dark garnet colored, full bodied with full forward black berry fruits with soft layers of chocolate mocha, baking spice and tobacco with supple soft moderate tannins on the finish.